Title: A NEW HISTORY OF ENGLAND. From the Earliest Period to the Present Time. On a Plan recommended by The Earl of Chesterfield. Embellished with Copper Plates, elegantly engraved from the Designs of Mr. Wale. Description: London, E. Newbery new edition 1788 Copperplates (6 including frontis) by Wale. . 16mo green vellum spined boards (marbled boards very worn & rubbed corners rounded). Frontispiece +177pp +pp books of E. Newbery. Name to head of titlepage & same initials to fly leaf, another name to fly leaf. Corner of one leaf torn off not touching print, a few signs of use but unusually clean and tight especially for a children's book. 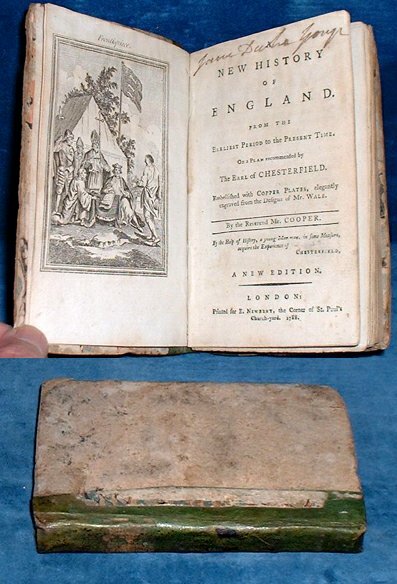 *Charming early history for the young and as an early edition scarce.